If you’re looking for a gift for Teacher Appreciation Week or for the beloved English teacher in your life, you’ve come to the right place! Here’s a list of ten gifts for English teachers. I’ve chosen a range of items in terms of price, size, and seriousness, so I know you’ll find what you’re looking for. Enjoy! How cute are these stamps? These are the sort of gift I LOVE because they are fun AND practical. A teacher could use these to quickly assess bellringers or journal entries, and maybe use a different stamp each day. These could also be used to code certain happenings in a planner or on a calendar. Love them! 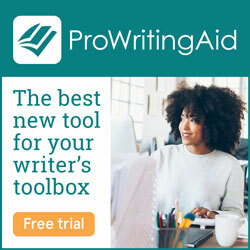 This blog uses Amazon Affiliate Links for your convenience. If you decide to purchase recommended gifts or books, please consider doing so through our affiliate links. Any avid reader can relate to this quote and chuckle. Luckily, we’re no longer in an age where people lock up women for loving novels, but there are still people out there who don’t quite understand a book nerd’s love of books. This quote calls to those who get it. I love that you can get it as a lovely necklace now! This design is pretty epic. This is the perfect gift for Teacher Appreciation because it acknowledges the many tasks and roles a teacher juggles. And seriously, can you ever have too many coffee cups? Like the last gift, this one seeks to remind others that teachers wear many hats and often go unappreciated. I love having multiple tote bags because I can leave them packed for various things. For example, I keep a tote bag packed when I’m directing a show that has the script, a water bottle, a snack, a sweater (our auditorium is COLD! ), and other necessities. I don’t have to pack it every morning – I can just grab it and go. What are your favorite gifts for English teachers? Coloring is cathartic, and this snarky coloring book will keep the teacher in your life chuckling! I love that this book is a blend of benign inspirational quotes and sassy observations of classroom life. You can ritualize coloring and self-care while still keeping it real. 6. A T-shirt on a Mission! 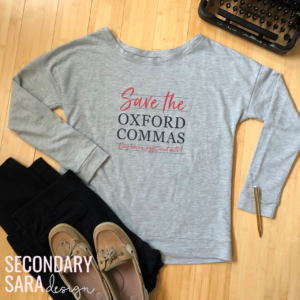 This shirt, designed by my friend Secondary Sara, is on a quest to Save the Oxford Comma! That’s a mission I can get behind. 🙂 Sara offers lots of other clever t-shirts for teachers, too. This is another gift with some pizzazz! 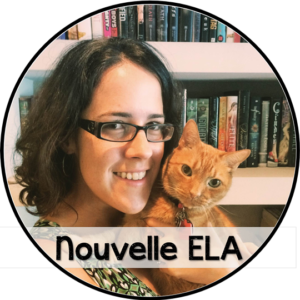 Students need bandages at the most awkward of times, so why not help your English teacher keep some in stock? These are funny and “on brand” for the English teacher in your life. More and more teachers are choosing to start their classes with a chime or another ritualized noise. Some students find clarity from listening to a chime or a short piece of music for a few minutes as they calm down after the transition between classes. This chime is perfect for that. This is another great gift that could be used in the classroom or hoarded at home for after-school chuckles. Magnetic Poetry can be a great release of creativity, since it’s hard to follow any rules or censor yourself too much while you’re working within the confines of magnets. And you never know when you’ll create the next masterpiece! Did I miss any of your favorite gifts for English teachers? I’d love to hear from you!